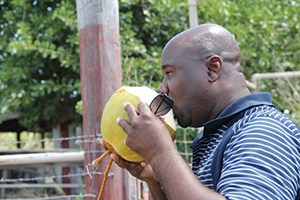 NIA CHARLESTOWN NEVIS (October 22, 2014) — The Ministry of Agriculture has reported success in its drive to vitalise the coconut industry on Nevis. “My Ministry has embarked on a drive to revitalise the coconut industry here on the island. The drive was started earlier this year during our second annual Agriculture Awareness Month in May. We made a call for individuals to donate coconut plants and the response was commendable with positive response as far as from St Croix. “The Department has since established a coconut nursery at New River which will be used to propagate coconuts from which plants will eventually be used for a replanting programme on the island,” he said. Meantime, Mr. Jeffers also used the opportunity to speak on the Ministry’s continued promotion of agriculture and what it had done in recent months to raise the islands agriculture profile. “Promotion of Agriculture is very high on the agenda for the Ministry and Department of Agriculture. We are very serious where this industry is concerned and therefore, we have embarked on a promotion drive like no other. We have taken promotion to another level, we have gone international. “We are now leading the charge, not in the Federation but the wider region and internationally in promoting Agriculture as a viable industry, one that is full of opportunities and one that is essential to our wellbeing. 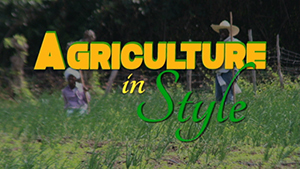 Through the programme “Agriculture In Style” we have so far been able to expose our stakeholders in the crop, livestock and agro processing. We believe that through this medium, more persons and in particular young individuals, would be attracted to the industry,” he said. The Minister underscored the Ministry’s relationships with its partners in agriculture and gave a commitment to strengthening them. “We must and will endeavour to strengthen the existing partnerships with our allied agencies including Inter-American Institute for Cooperation on Agriculture, the Caribbean Agricultural Research and Development Institute, the Republic of China on Taiwan, the Food and Agriculture Organization and other regional and international organizations. “We have in the past realized significant benefits from our association with these agencies and we believe that they have a lot more to offer that we may not be taking full advantage of. We in this Ministry believe in partnerships and it is our intention to avail ourselves of every opportunity to strengthen existing ones and forge new ones where possible,” he said. In conclusion, Mr. Jeffers thanked staff at the Departments of Agriculture, Fisheries and Cooperatives for the hard work over the years. He also commended their clients, the farmers, agro-processors and all stakeholders in the Agriculture industry and called on them to continue their support. “I encourage all of us to continue to support the industry, as we strive to take it to levels it has never reached before. “It is timely that this consultation is being hosted on World Food Day. Let us embrace family farming and ensure that we continue to feed the world and care for the earth,” he said.